We think spring is finally trying to come even though it is hard to believe with some of the extremes of weather the last little while. 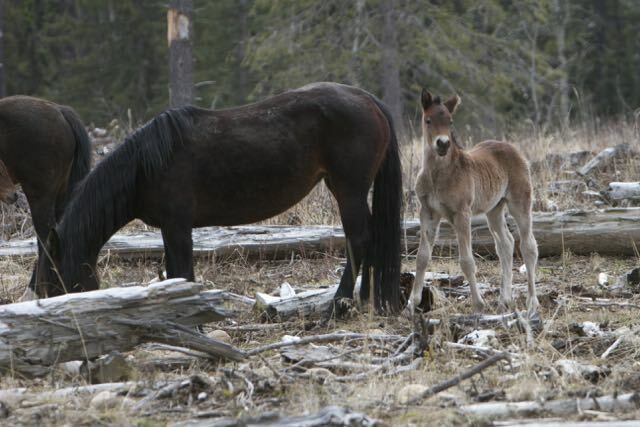 It is enjoyable to visit the wild horses and witness all the new foals with the herds. One of our favourite little herds, a beautiful stallion with 2 mares, produced these 2 healthy foals. 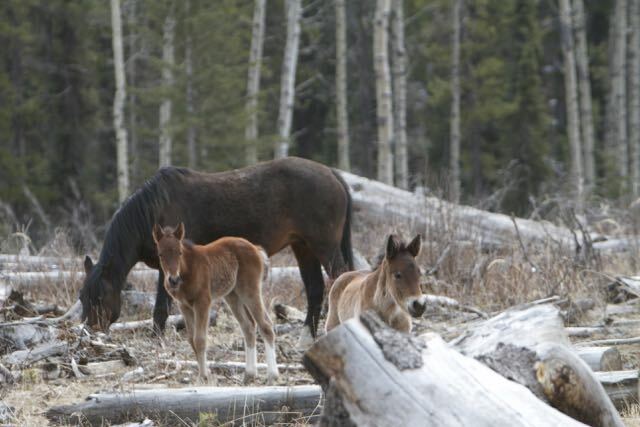 The first shows a little colt with his mom, and the second a filly, about a week younger, with her dame. It is amazing to watch how quickly these little ones learn how to navigate through the old cutblocks. This time of year the horses do quite a bit of rolling to remove their winter coats, dander and to help get rid of any parasites. This little girl can’t quite figure out what mom was doing so danced around all excited. The baby wanted her warm milk and wanted her mom to stand up. At the WHOAS handling facility the mare we call Blondie” foaled on Easter Sunday. Her baby is little filly we’ve named “Chrissy” who is very healthy. Although Blondie has been darted with the contraception and had a pregnancy break last year, she is just one of those mares that is very fertile. Here is a short video of mom and babe taken yesterday when Chrissy was 5 days old. 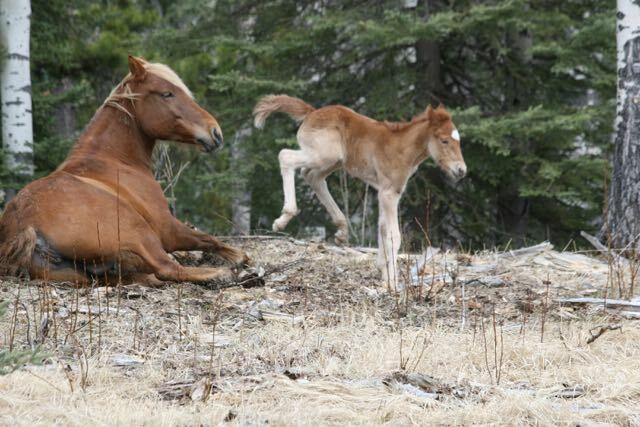 As you watch you can witness Chrissy having the same reaction as the foal pictured above when Blondie took a luxurious roll. We hope you enjoy the antics! We will be visiting Calgary this summer. 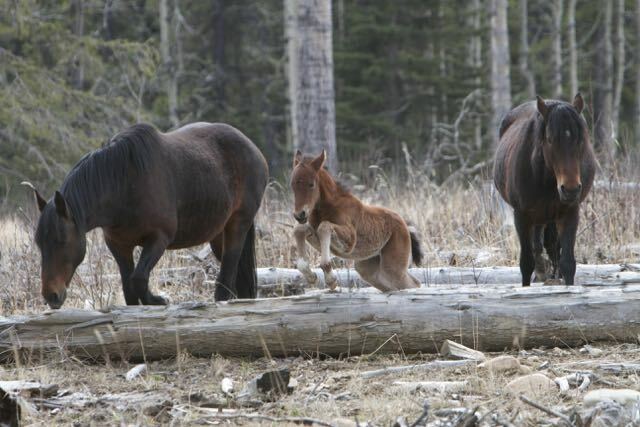 Is it possible to see the wild horses somewhere nearby? Not to sure about West of Calgary, your best bet would be West of Sundre or Caroline and it is hit a miss at the best of times. 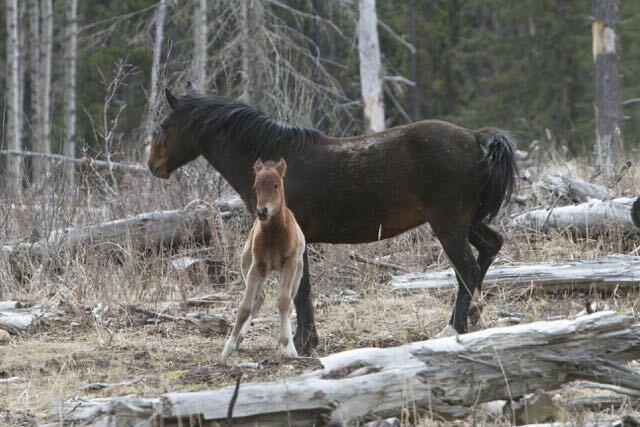 Last week we went west of Caroline (down the forestry roads) then South toward Sundre and made a loop back to Caroline and saw 4 herds for a total of 48 horses (4 colts). Other times we go out 4 or 5 times and never see one horse.